French company Archos is stepping out to give us a preview of what it will show the world at CES, which starts in less than a week. 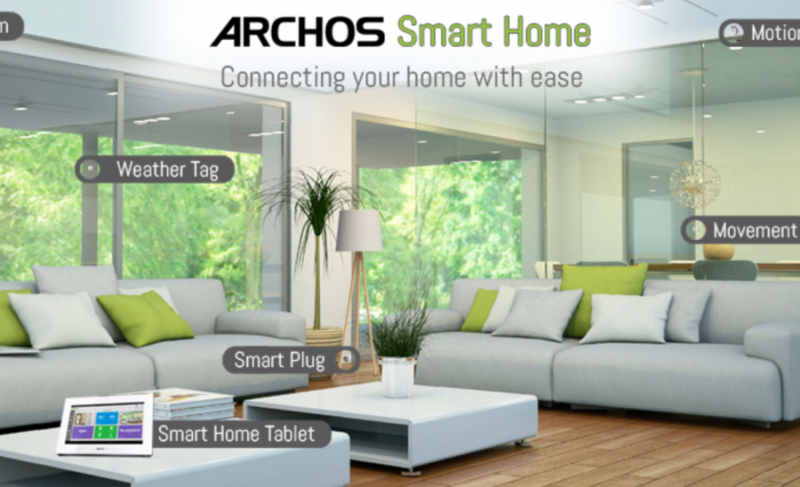 In an unsurprising move, Archos is introducing a whole range of connected devices for the home that will interact with iOS and Android phones to give users the ability to control their home environment. The product range includes cameras for video surveillance, motion detector devices for intrusion detection, sensors that detect when doors and windows are opened, weather sensors to track temperature and humidity, and smart plugs to switch on or off small appliances. The range of sensors is quite enabling for an off-the-shelf home automation system, but the most difficult part – as always – will be to snap the right user experience for controlling the devices. For doing this the company is releasing their iOS and Android apps (no Windows Phone for now) and is also releasing a dedicated Android tablet customized to better monitor the Archos smart home devices. The company does note it’s a full-fledged Android tablet, so users can also use it to check e-mails, etc. In an attempt to make it easier to get things right out of the box, the Archos app includes something called Scenarios. It’s a simple way to define what happens in a given case, pretty much like how IFTTT works. So consumers can have something like “if the front door is opened, turn on the lamp in the hallway and turn it off after 5 minutes”, or “email me a photo of the hall if the front door is opened during working hours”. I don’t see Archos as the most user-friendly brand, since they tend to deliver complex user interfaces and troubled experiences, so I’m curious to see how this will perform at controlling a complex home automation system. From the press photos, the hardware looks as if taken from a late 90’s tech geek magazine, but admittedly some of the sensors look remarkably small – like the motion detection sensor and the camera device. We will be covering the news from CES next week so we hope to get our hands at the Archos connected home devices and see how good it is.